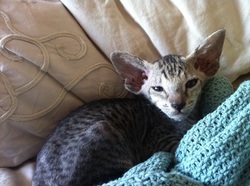 Polly is the epitome of Peterbald personality - loving and playful and just a little bit crazy. Polly is such an intelligent young lady and almost human-like. She loves to cuddle with her "dobernanny" - our dog Pippa. Nefertiti is a very special girl. 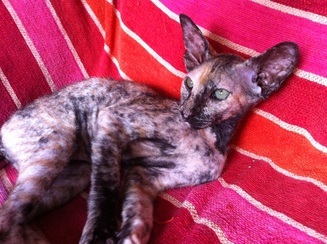 We have always wanted a tortie Peterbald and Nefertiti embodies all the traits of a tortie, which, combined with the Peterbald nature, is a recipe for a HUGE personality...this girl is playful, confident and amuses herself (and as a direct result her owners) for hours with plastic bags and marbles. Thanks to her beautiful father, Jinny, Nefertiti is a massive girl, bringing much needed size and resultant good health to the breed. Dotty is a darling. Loving, affectionate, playful and very attention seeking. We are so proud of this Einstein baby.